Here’s what’s up in the world of TV for Monday, July 16. All times are Eastern. 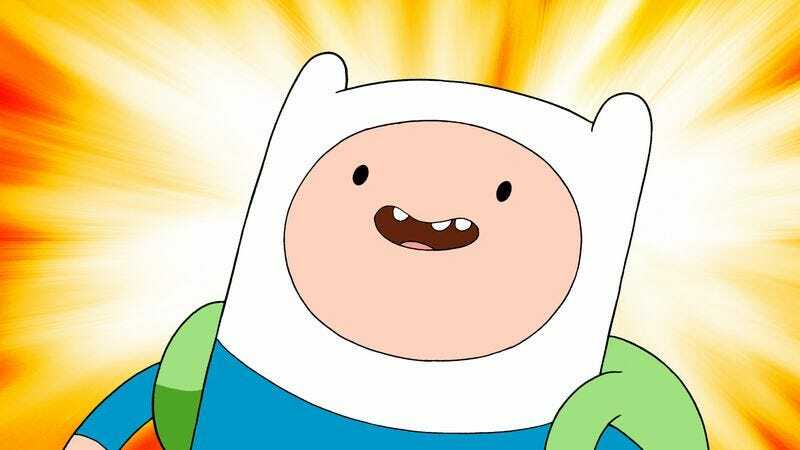 Adventure Time (Cartoon Network, 7:30 p.m.): Direct from its indirect triumph over all of Comic-Con—thanks to Finn and Jake headgear being damn near ubiquitous—the series returns after a brief hiatus, with the dynamic duo playing an epic game of Card Quest. After winning over the San Diego Convention Center, however, we’re willing to bet that Finn and Jake’s next stop will be, predictably enough, the world. They won’t stop until every single person is either wearing one of those weird white hats with the ears on it or is dressed like a yellow dog thing. And they’ll do it via force if they have to. So watch. Then buy a hat. Bunheads (ABC Family, 9 p.m.): Erik Adams is away, so Todd VanDerWerff takes a look at an episode in which Boo’s new job puts her in close proximity to an attractive bartender, which is the sort of thing that happens to Todd all the time. Todd is also a teenage aspiring ballerina. Bet you didn’t know that. Lost Girl (Syfy, 10 p.m.): Trick tries to look into the future, and we’re betting that he’ll see that the show is leaving this time slot behind to head off for the wilds of Friday, where so many science fiction and fantasy shows have been successful in the past! Kevin McFarland just loves staying home on Fridays! Teen Wolf (MTV, 10 p.m.): Scott and Stiles develop a new plan to take out the shapeshifter, and since it’s not yet the season finale and since those two aren’t the best at this whole “making plans” thing, we’re going to guess it fails. Phil Dyess-Nugent once built a shapeshifter trap with peanut butter as bait. The West Wing (11 a.m.): President Bartlet is a great role model in many, many ways, and just one of those ways involves his love-making technique, which is both lengthy and substantial. Just ask his wife, who enjoys the afterglow of his convincing election win in this episode. Steve Heisler can’t unsee it. Strangers With Candy (3 p.m.): Jerri wants to be popular, so she’s doing the one thing that will make her so: joining the debate team. We tried that back in high school, Jerri, and the way it worked out for us is that we were the most popular people ever. Or, at least, that’s what Meredith Blake has told us. The Batmobile (The CW, 8 p.m.): We have no idea why The CW is airing a half-hour documentary about the Batmobile—well, obviously, it’s because The Dark Knight Rises is out at the end of the week—but here it is, if you’re looking to watch a special about the Batmobile while reading glowing TDKR reviews. Eureka (Syfy, 9 p.m.): It’s been five seasons, and the quirky series about a small town full of super-geniuses is coming to an end, even if it sometimes seems to us like only two or three of the original cast members are still around. Weirdly, we’ve never written about this show, but we just might start! Market Warriors (PBS, 9 p.m.): The strength of American Pickers is so impressive, it would seem, that even PBS is now ripping it off, though we hope PBS will do something more creative with the idea of people driving around and looking at antiques to find the most valuable ones than a straight ripoff. Degrassi The Next Generation (TeenNick, 10 p.m.): The spinoff of a spinoff (maybe of a spinoff?) is beginning its 12th season, and we’d just like to remember how many CW actresses the series has brought to us, including Nina Dobrev, who played a girl who had a baby at 13, of all things. The Prestige (IFC, 8 p.m.): Here’s another opportunity to get ready for The Dark Knight Rises, as you can watch the film Christopher Nolan made between Batman Begins and The Dark Knight, which is actually a terrific little mind-bender, complete with great performances and lovely, lush cinematography. MLB Baseball: Angels at Tigers (ESPN, 7 p.m.): Things looked grim for both these teams earlier in the season, but both have managed to pull things together enough to sit at second place in their respective divisions—though both will need to make up a lot of ground to get up to first. It could be a good game. The Newsroom (Sunday): Scott Tobias is on a mission to civilize our coverage of this Aaron Sorkin series, and he found the fourth episode to be a step down from the previous three. Did you agree? Or do you think Scott has some sort of unfortunate, anti-Sorkin bias preventing him from seeing the truth?